Days ago Gold reached its 5-year trendline resistance but since then it has backed off while the rest of the precious metals sector has taken a beating which accelerated into the weekend. Although Gold lost only 1% on the week and the US Dollar was only fractionally higher, Silver lost over 4% while the gold stocks (GDX and GDXJ) lost 6% and 7% respectively. The major breakout in the sector is obviously not imminent as a correction has started. A deeper look into the market (beyond Gold and the US Dollar) reveals that Gold needs to gain more relative strength in order to breakout this year. Gold’s lack of relative strength is why it has not broken out yet despite testing trendline resistance twice in the last five months. Since the sector low in December 2016, Gold’s strength has been driven mostly by US Dollar weakness. That is clarified when we plot Gold against foreign currencies (FC). That plot is up only slightly since that important sector low leading into 2017. That shows us that US Dollar weakness is responsible for Gold’s strength. 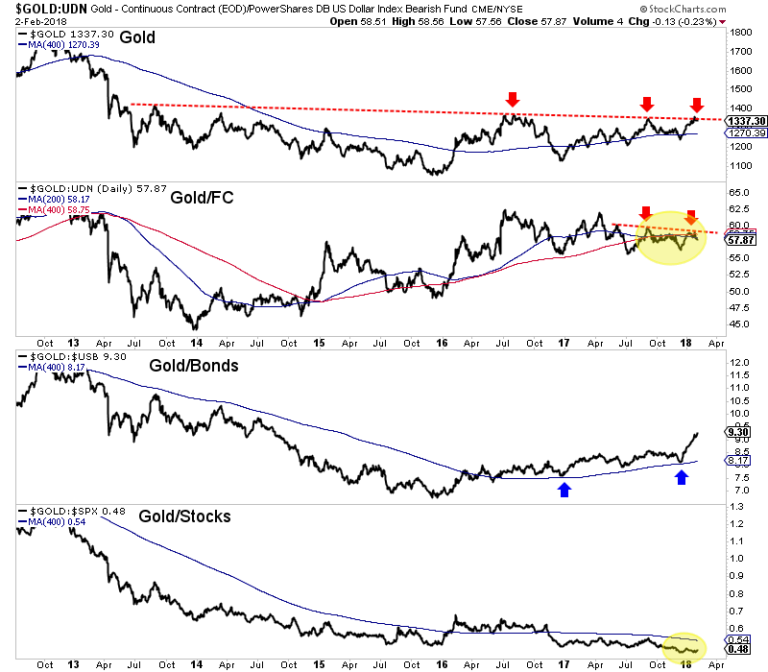 Moving beyond Gold/FC we do see that the Gold/Bonds ratio is in a healthy uptrend but Gold/Stocks has been entrenched in a long-term downtrend that was briefly interrupted in January 2016. In order for Gold to breakout this year, it will need to regain outperformance against FC or reverse its downtrend relative to stocks. Note that Gold/FC just failed to breakout. It would be very encouraging if Gold would begin to outperform Stocks even as its correcting or consolidating. The recent relative weakness in the gold stocks and Silver is another reason we don’t expect Gold to breakout until the summer. In recent days Gold had been holding strong while the gold stocks were already selling off. Below we plot a handful of indices and most of these have already lost their 200-day moving averages. GDX failed to reach resistance in the mid $25s and GDXJ did not come close to its September 2016 peak. Gold and the entire precious metals sector is in position for a big breakout this year but we will need to continue to wait for such a move. Gold’s strength has been driven almost entirely by US Dollar weakness and that by itself does not amount to a full blown bull market in precious metals. 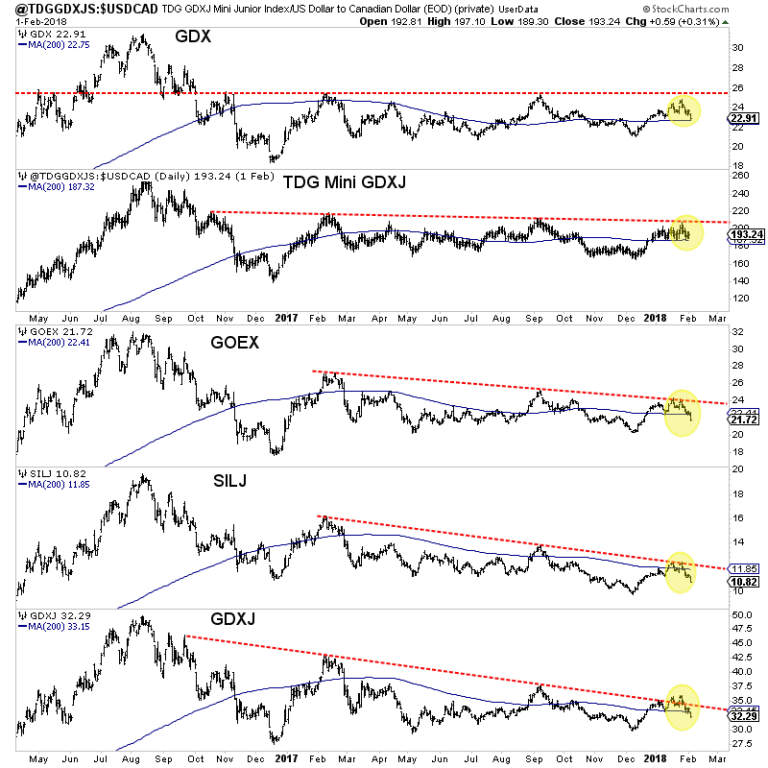 Gold needs to show more relative strength and in particular against stocks and or foreign currencies. That has been lacking for the past year. This is important to watch because Gold could start to gain relative strength ahead of the start of the big moves in the sector. With the strong outlook for the second half of 2018 and 2019, any weakness is an opportunity to accumulate the juniors that could make huge moves when Gold breaks to the upside. To follow our guidance and learn our favorite juniors for 2018, consider learning more about our premium service.